I think for the first time ever I will participate in Randy Seaver's Saturday Night Genealogy Fun. I am usually busy with family on Saturday's but I saw his blog posting on Facebook and decided I liked the topic. Randy posted his "genea-bucket list" and I decided to do my own. What is on your Genealogy Bucket List? What research locations do you want to visit? What do you want to accomplish with your genealogy research? List a minimum of three items - more if you want! 1. Become a certified genealogist through the Board for Certification of Genealogy. 2. Visit the towns and parishes of my ancestors' homelands in England, Denmark and Sweden. 3. Write up the history of my ancestors in a fully documented format, one line at a time. This I will share with my family, including distant cousins I have found who share my interest, and the libraries and historical societies in the locations my ancestors lived. This post is part of my continuing series of guest authors sharing their perspective on different courses at genealogy institutes. This one features Laurel Baty, CG writing about a course at the British Institute held each October in Salt Lake City, Utah. My first experience with Genealogy Institutes was in October 2007 when I attended David Rencher’s class, Irish Research: Sources and Methods for Research in Ireland, at the annual British Institute in Salt Lake City. I was a novice to Irish genealogy and learned so much during that first class and had a wonderful experience. I have attended the British Institute annually since 2007 and enjoyed every class I have taken. The British Institute, sponsored by the International Society for British Genealogy and Family History [ISBGFH], offers a unique format: lectures in the morning with instructor consultations and guided research in the afternoon at the Family History Library. Where else can you learn about records in the morning and have hands on research in the same records in the afternoon? The instructor consultations are a wonderful addition to the classes. At the British Institute in 2011 I attended Advanced Methodology for Irish Research taught by David E. Rencher which will also be offered in October of 2012. I highly recommend this unique class. The other Irish classes I have taken from David Rencher were about the records of Ireland and how to locate them [Governmental Records of Ireland in 2009 and Making the Transition from Irish Church Records to Irish Land Records in 2010]. The Advanced Methodology class taught us what to do with the records once we found them and how to utilize Irish records to solve genealogical problems. After a morning packed with lectures we headed off to the Family History Library in the afternoon to test our new found knowledge and consult individually with David Rencher, a world renowned expert in Irish genealogy who also happens to be the Chief Genealogical Officer of Family Search! The consultation is worth the cost of the class! Make sure to bring your Irish research problem—you may topple a few brick walls. · Records and Strategies for Beginning English Research taught by Judy Jones. There are four genealogy institutes in the United States which provide excellent genealogical training. 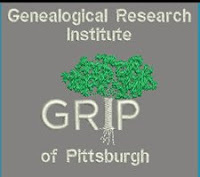 They are the Salt Lake Institute of Genealogy (SLIG), the Institute of Genealogy and Historical Research (IGHR), the National Institute for Genealogical Research (NIGR) and the Genealogical Research Institute of Pittsburgh (GRIP). I have attended three of these genealogical institutes and recommend them to all serious genealogists. 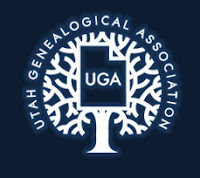 The advantage of a genealogical institute over a conference is that you study one track or topic for the whole week, thus receiving an in-depth education from some of the top genealogists in the country. Two of the institutes, SLIG and IGHR, offer ten different tracks to choose from each year. 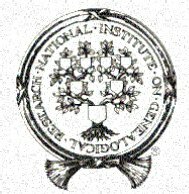 The National Institute for Genealogical Research (NIGR) is held at the National Archives in Washington, D.C. in July. This institute provides an on-site exploration of federal records. Presenters include professional genealogists and NARA archivists and cover records such as military, land, immigration, census, as well as many other types of federal records that can be used for genealogical research. There are optional evening sessions at the Library of Congress and Daughters of the American Revolution (DAR) Library. You can sign up online to receive a copy of the registration brochure to be sent out in February. Can you really learn about genealogy on YouTube? This is the first in a series of articles on locating genealogy teaching videos on various YouTube channels. I challenge you to watch at least one and learn something new. Did you know the National Archives (NARA) has a YouTube Channel? The archivists are creating short videos on records in their possession as well as putting videos of recorded presentations online. Most of the recorded lectures come from their "Know Your Records" series of live presentations given at the National Archives since 2005. Now you do not have to go to NARA in Washington, D.C. to see the presentations, but can learn about these records from the comfort of your home. Here are links to a selection of the videos available, but there are hundreds more. This is a six minute video that shows what pension files look like and how they are digitized. This is a big week in the genealogy world with both the Southern California Genealogy Society Jamboree and the Institute on Genealogy and Historical Research at Samford University. I was not able to attend either event this year, but am able able to get a little taste of the fun by following my friends through Facebook posts and genealogy blogs. Randy Seaver posted a SCGS Genealogy Jamboree Blog Compendium on his Genea-Musings blog with links to many other blog posts about the Jamboree. This is a fun way to read the play by play about the conference. The stalking report by Sheri Fenley at Jamboree 2012 and Progress on My List was one of my favorite accounts. If you know of others who are blogging about their experience in IGHR courses then please leave me a link in the comments. I would love to read more. In December 2007 I joined a new Rootsweb mailing list called the Transitional Genealogists Forum (TGF). This list provided a place for genealogists transitioning into professional work to network and ask questions. Respected professional genealogists also joined the list to answer questions and share their advice. In one post to the list I asked Elizabeth Shown Mills about educational preparation for certification through the Board for the Certification of Genealogists . She recommended studying Professional Genealogy: A Manual for Researchers, Writers, Editors, Lecturers and Librarians  and attending genealogical institutes and university-sponsored programs. Another participant on the discussion list asked about options for those unable to attend formal programs. 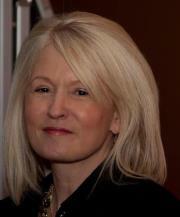 Ms. Mills wrote a ten-point blueprint for enhancing the skills of any serious genealogist . She has given me permission to share it on this blog as it is excellent advice for anyone seeking to improve their genealogical skills. Read all the "Skillbuilding" articles, study all the work samples, and do the "Test Your Skills" module at the Board for Certification of Genealogists website. 2. Greenwood, Val D. Researcher's Guide to American Genealogy. 3d ed. Baltimore: Genealogical Publishing Co., 2001. Read Greenwood from cover to cover--several times or until you feel you have well learned its content. For three decades, this has been the leading textbook for genealogical study, and Greenwood has kept it up to date. It's big, but easily digestible. This is the textbook for the NGS Home Study course and is the equivalent of Samford IGHR's Course 2 (Intermediate Genealogy). 3. Professional Genealogy: A Manual For Researchers, Writers, Editors, Lecturers, and Librarians. Baltimore: Genealogical Publishing Co., 2001. 4. Mills, E. S. Evidence Explained: Citing History Sources from Artifacts to Cyberspace. Baltimore: Genealogical Publishing Co., 2007. 5. The BCG Genealogical Standards Manual. Provo: Ancestry, 2000. Read *all* of the standards, starting with the Genealogical Proof Standard. Examine the appendixes for the models they provide. National Genealogical Society Quarterly , 1987-to date. **Study** the case studies in every issue you can get your hands on. It does not matter what family or what region the case study deals with. You are studying it for techniques and methods. Almost every library with a genealogical collection,as well as many university libraries, have NGSQ. At www.worldcat.org you can identify libraries in your region that carry it. NGS has also begun to put back issues online at www.ngsgenealogy.org, if you are a member. Rising, Marsha Hoffman, CG, FASG. The Family Tree Problem Solver. Cincinnati: Family Tree Books, 2005. Luebking, Sandra Hargreaves, and Loretto D. Szucs, The Source. 3d ed. Provo: Ancestry, 2006). 9. If you live within driving distance of other serious genealogists, consider starting a study group along the Litchman Model that has been discussed over the years in various NGS and APG forums. Basically: the groups that follow the Litchman Model meet monthly, choose a case study (usually from NGSQ) for each month's meeting, require participants to read the assigned case study at least three times, make notes, and come prepared to discuss the methodology, sources, and strengths and weaknesses in the research or analysis. Check the APG-L archives for discussions particularly by the late Ken Aitken regarding his group. Needless to say, winning any of these scholarships puts one on the fast-track professionally, from the standpoint of recognition of one's merit. Angela McGhie, "Thanks Elizabeth " Transitional Genealogists Forum, discussion list, 18 December 2007 (http://archiver.rootsweb.ancestry.com/th/read/TRANSITIONAL-GENEALOGISTS-FORUM/2007-12/1198006142 : accessed 6 June 2012). Professional Genealogy: A Manual For Researchers, Writers, Editors, Lecturers, and Librarians. Baltimore: Genealogical Publishing Co., 2001. Elizabeth Shown Mills, "Educational prep & mentorships," Transitional Genealogists Forum, discussion list, 19 December 2007 (http://archiver.rootsweb.ancestry.com/th/read/transitional-genealogists-forum/2007-12/1198123606 : accessed 6 June 2012). We're making the last big reveal leading up to this weekend's Genealogy Jamboree. 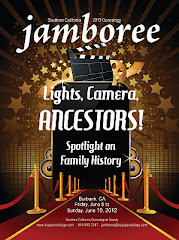 In keeping with SCGS's tradition of delivering exceptional genealogical education over the Internet, we are proud to announce that the 2012 Genealogy Jamboree will offer ten streamed sessions over two days, Saturday and Sunday, June 9 and 10. Streamed sessions will be delivered at no cost to the viewing audience. As speakers permit, sessions will be archived and made available for viewing after Jamboree through the SCGS webinar archive. While we are not charging to view the sessions, we greatly appreciate the support of the genealogical community in making contributions to offset the expense of bandwidth, speaker honorarium, equipment, camera operators, etc. SCGS is a 501(c)(3) nonprofit. There are a limited number of viewing "seats" available for each session. For that reason, we will go off air in the time between classes and will ask viewers to register for each individual session. We appreciate everyone helping to "share the wealth" with other family historians around the world. Read to put your ancestors into their own world on their terms. Learn how to find books about the social, cultural, political, occupational, and religious lives of your ancestors. Learn creative ways to capture the imagination of your non-historian friends and relatives, while honoring your ancestors. The joy in genealogy isn’t just climbing your family tree, but building bonds with current and future generations, and this class will show you high tech and low tech ways to do just that. You are guaranteed to be inspired! When a family secret alters our understanding of the family tree, when we learn about a hidden relative (or a hidden marriage, or a hidden divorce, or a hidden cause of death), how do we pursue it? Steve reveals how he assembled the paper trail that led through burial records, birth certificates, hospital records, immigration documents and wartime records, and assembles them into a coherent paper trail. This session is more of a “how-to-think” than a “how-to.” Beginners, intermediate and advanced researchers will come away with new ideas for unearthing what had been hidden. Participants will learn about the National Archives Microfilm Catalog database, guides to the holdings of the National Archives, and use of electronic databases mounted on the National Archives website. Discover the methods used to create a compiled genealogy and how to ensure its contents do not lead you down the wrong trail. Find, access, and explore genealogical resources quickly. Develop, expand, and sharpen your genealogy research skills. Discover clues to trace and explore your family ties. Quickly identify which record collections to search first. Learn to find and use specific country, state, and county records... And much more. Source for the presentation is MyGenShare.com. Complex Evidence: What is it? How Does it Work? Why Does it Matter? See a Complex Evidence Case Study. Learn why complex evidence is the only way to establish identity or prove relationships. The National Archives holds military records documenting service to the United States from the American Revolution to the present day. This session will identify and describe the vast array of documentation for different time periods including examples of those that are rarely used. 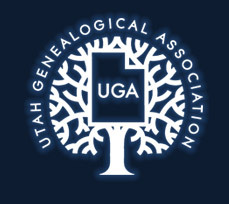 Many genealogists miss opportunities to find consequential documents for advancing their research because they do not follow a standard research methodology, namely the “historical research methodology.” Special care is given in this lecture to emphasize the importance of some rather fundamental basics which, when used together, make for a powerful data-gathering methodology. This lecture explains the advantages of using diaries, letters and journals in compiling and comprehensive and appealing genealogy. Opinions and observations written by our ancestors or someone who knew them add a personal dimension to names, dates, and places. We'll explore a few examples of the different types of journals and diaries available, where to find them, and how to apply what you find to your research and your family history. The Southern California Genealogical Society also hosts live webinars twice a month through their Jamboree Extension Series. These presentations are free to view on the first Saturday and third Wednesday of the month, and archived online for SCGS members. The next webniar will be Wednesday, June 20th with Rick Crume presenting "Genealogy Hacks: Tricks to Crack the Top Genealogy Web Sites."